Advance your career with this dynamic tool for acing the technical pilot interview...Let an experienced airline pilot help you succeed on the Technical Pilot Interview. This one-of-a-kind study tool asks the right questions so you'll know the right answers. Open it and start learning what you need to know in order to get a powerful edge over the competition - at every stage of your piloting career. This unique study guide helps you: get to know material likely to be asked on your interview; practice with almost one thousand exam-style questions - complete with answers; build confidence, skills, and knowledge; and, focus your study on what you need to know.Can you answer these questions? If you were loading an aircraft to obtain maximum range, would you load it with a forward or aft center of gravity? Why does an aircraft climb as high as possible? What does an aircraft descend quicker when it's lighter? What is a fail operational autopilot/landing system? What is an assumed/flexible temperature? Open this study guide for: answers to almost 1000 questions you may be asked during the technical interview; more than 50 illustrations to clarify key essential points; comprehensive coverage ranging from light aircraft to heavy jet operations; a convenient quick-find, cross-referenced presentation; and, material that has global application. * Focus your study on what you need to knowCan you answer these questions? * If you were loading an aircraft to obtain maximum range, would you load it with a forward or aft center of gravity? * Why does an aircraft climb as high as possible? * What does an aircraft descend quicker when it's lighter? * What is a fail operational autopilot/landing system? GARY V. BRISTOW (Surrey, England) is an airline pilot. 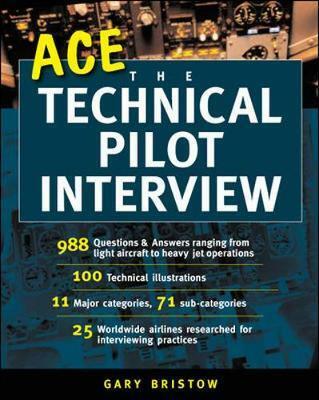 His own interviewing experiences made him realize how valuable a book such as this would be in advancing a pilot's career.